This model was developed to verify the stability of the heater regulator loop of the LTZ1000 precision voltage reference. 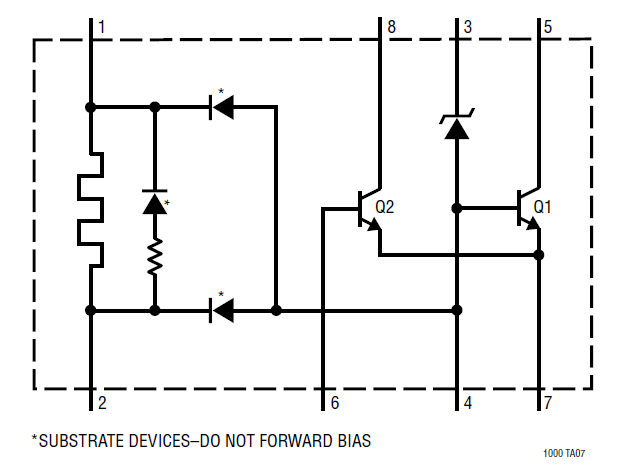 The LTZ1000 is equipped with a heater element and a temperature sensing transitor (Q2 in the schematic below). The nominal base-emitter voltage of a bipolar transistor is temperature rependent, with a slope of approximately -1.8mV/°C. Q1 is used to regulate the current in the Zener. The problem was to use LT Spice to simulate the thermal coupling between the heater element and the temperature sensing transistor Q2. 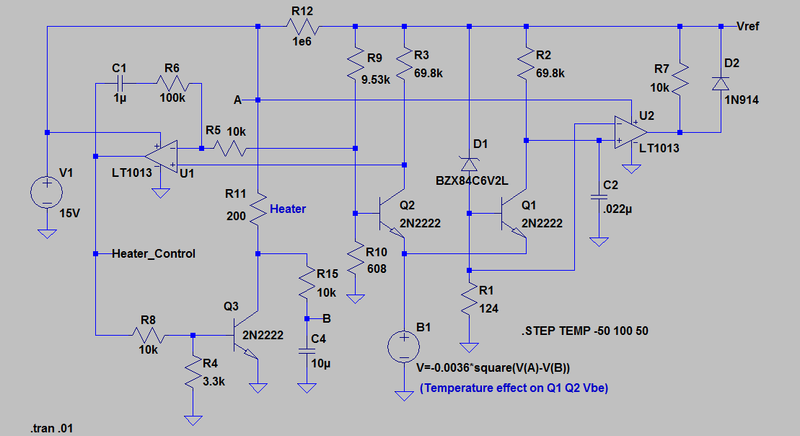 This was done by adding a voltage source in series with the base-emitter junction of Q2, the voltage being a function of the power dissipated in the heater as shown below. R6/C4 form a low pass filter used to simulate the thermal time constant between the heater R11 and the sense transistor Q1. This constant was determined empirically and does not need to be exact for the model to work, even though a more accurate model will allow a more effective compensation for the regulator, particularly if the ambient conditions are expected to vary (insufficient thermal isolation). The filtered voltage across the heater (V(A)-V(B)) is used to calculate the offset voltage added to the Vbe of Q1 and Q2 with source B1. Note that there are two variants of the LTZ1000, the LTZ1000 has 80°C/W thermal resistance, while the LTZ1000A has 400°C/W thermal resistance, thanks to a prorietary die-attach technique where the die is suspended above the bottom of the TO-39 package. which is the constant used in the formula for B1. The complete LT Spice model is available here.